Everyday there is an innovation which is designed to make life simpler. Everyday products are becoming obsolete because of these new advancements in technology. A drying rack or a clothes stand is another object that is facing this problem. With the innovation of electronic clothes dryer, it is no longer considered to be the necessity that it was, years ago. But can an electronic clothes dryer give you the benefits of air drying? No. Nor is it affordable for every middle-income household. So therefore, it hasn’t actually truly disrupted the market of a drying rack. A drying rack can be made of something as basic as plastic or something more flexible and sturdy like steel coated rods. These days, the drying racks too, come with additional features, to make them seem more attractive in the eyes of consumers as well as to enable themselves to compete with the electronic clothes dryers that are available in the markets. Because of these additional features, consumers now face a dilemma even while purchasing a clothes drying rack. They need to weigh up the cost and benefits of each product, and thereby make a wise purchase decision. Cost-Benefits trade off: While purchasing anything in this world, consumers look at this trade off the most often. Similarly, while purchasing a clothes dryer look at whether the cost justifies its benefits, or it is just an over-priced article. Sturdy: While deciding which clothes drying rack to purchase, it is imperative to check whether it’s a sturdy piece or not. You don’t want it to break or not work to the best of its abilities in just a couple of months. Portability: While this may not be a crucial factor for everyone, it is definitely something that should be considered. One of the cons of drying stands is that they aren’t considered to be portable enough for the modern generation consumers. However, there are a lot of options among dryers as well that tackle this problem. Some of them are foldable, some of them are light and so on and so on. 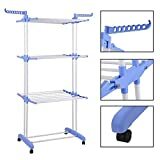 Size: Size may be a crucial factor for a lot of people because of the space clothes drying racks/stands generally take up. SUITABLE FOR THE CLOTHES THAT NEED TO LAY FLAT TO DRY: Features a top shelf for sweaters or other flat-drying items. Made from Precision Steel Tubes with higher grade ERW-2 with tensile strength of more than 40 Kg/mm2. Pure Polyester powder coating for durability and rust resistance. ➤ DRYING SPACE - 55 Feet of Drying Area + 24 Hanger Slots for Drying lots of clothes at once. ➤ EASE OF USE - Can be folded to form different combinations. Example - Fold The middle frame if you need to Dry a Bedsheet on the top frame as it requires more space for hanging. ➤ UNIQUE FEATURES - High Quality Wheels at the bottom for moving the rack conveniently. SS Screws and nuts provided for additional strength. High Quality Stainless Steel rails. ➤ SETTING UP - Sets up in minutes with comprehensive set-up Guide provided. Ideal for placement in your Balcony. ➤ LIFETIME WARRANTY - Life time replacement warranty in case of rust or breakage. 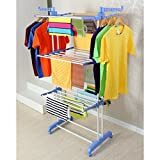 We have also picked our own choices to give you more idea and information about top clothes drying racks in India.Check the below list and choose one that can best serve you. Now that you have some information at least on what to look for and what not to look for, here are five of the best clothes drying rack/stand that you can look at while deciding what to purchase. Available in different colours, this 5 kg drying stand comes with foldable frames, wheels and plastic attachment with holes that enable you to hang your clothes on hangers. It’s body is made up of steel and plastic, making it a sturdy piece. It’s design helps to improve the ventilation, save space and enhance its portability. With 6 hanging frames, 3 on each side, there is enough room for all your garments. The product dimensions are 81.4 x 38.2 x 19.8 cm. This is the best cloth drying rack in India . The distinguishing feature of this clothes drying rack is the material that is used for its body. Since, it is made out of stainless steel, this clothes dryer can take weight unlike many others. Wet clothes, irrespective of their weight can therefore, be used to dry on this. In addition to this, it weighs only 449 grams.This is second one in our list of best cloth drying rack in India . Because of it’s weight, foldable nature, and wheels at the bottom it is highly portable as well. The product dimensions are 22x14x7 cm and it has 6 hanging frames totally. With multiple rods to hang your clothes and additionals slots, where you can hang the clothes that are attached to a hanger, this clothes drying rack has high utility. It is considerably large in size, with it’s dimensions set at 103x29x11 cm. The entire product is made out of PPCP and plastic coated steel pipes.This is third one in our list of best cloth drying rack in India . The product dimensions of this product are set at 154.9 x 88.9 x 58.4 cm and it weighs just 2.7 kgs.This is fourth one in our list of best cloth drying rack to buy online in India . The maximum load that this clothes drying rack can take is 20 kgs. It is perfect for those people who have limited garments, for eg, bachelors, etc. Yet, it is foldable and made out of good quality steel, to ensure durability. As the name suggests, this product is made up of 6 pipes. These 6 pipes are constructed in such a way as to create 36 feet of drying space. 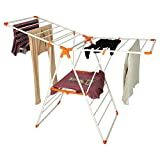 An added bonus feature of this product is that although, it’s length and width are fixed, it’s height is adjustable.This is fifth one in our list of best cloth drying rack to buy in India . The body is completely made up of stainless steel and it weighs 4.4 kg. Unlike other drying racks, it can be completely disassembled and can be attached to your wall, ceilings etc.